such a cheap sleeve, naked girl and all, could be a good one. produced and compiled with passion. Get & Spread.. 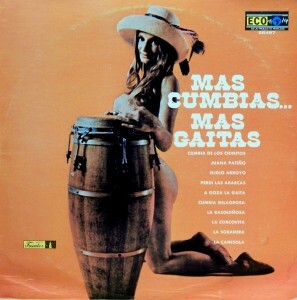 This entry was posted in Colombia, Cumbia, Gaita, Tropical de Colombia by Moos. Bookmark the permalink. Many thanks for this cumbia and your other great recent posts of the City Boys Band and others! Oh well… I should probably be posting this comment somewhere else (i.e. : one of your absolutely terrific Malian, Senegalese or Zimbabwean posts that I love so much), but, as a) I seem to recall your mentioning you don’t get a whole lot of feedback on this other stuff, b) I also like cumbia and vallenato quite a bit (truly enjoyed some pieces on this one) and c) I happen to be a Spanish-speaker, I’ll just go and leave my heartfelt thanks for your whole blog. Much, much enjoyed and appreciated.